Have you missed our updates? Forgive us for not being able to make it regular. Let’s quickly try and cover everything major we’ve been up to since the last update in February (phew!) We’ll do that in 2 mins tops. And yes, the Referral promo for SAFSMS is still on! We’ve been getting lots of questions about this. You earn 20% of the sign up fee for EVERY school you introduce to use SAFSMS. Due to the number of referrals we’ve been getting, our response time may take up to 2weeks, but we’ll definitely get in touch and reward all successful referrals. So if you haven’t, What are you waiting for? Find out more now! FlexiSAF Abuja squad is warming up for some footie fun on the 12th of May. Team Faiz will be battling Team Alameen for major bragging rights & more. We’re excited; football, food & all-round fun! Of course, we’ll keep you posted on social media. 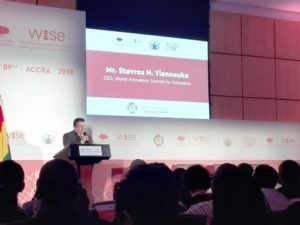 World Innovation Summit for Education came to Accra & we were there! Check out the hashtag#WISEAccra on Twitter to see how it went. Our Friends at Edugist are doing a pretty good job with the Education Dialogue, and we’re proud to partner as sponsors of the show. If you’re in Lagos, catch the Education Dialogue on Radio One (103.5FM) Every Tuesday by 6.30pm. Faiz, our CEO was on the show sometime in March talking about the importance of tech in today’s education. Business Investor & mentor, Tomi Davies paid us a visit on 23rd of April and gave us a brief pep talk about teamwork. We learnt that team work has a lot of benefits and that proper communication, professionalism and a good attitude to work play a huge role in making team work, well…work. Flexisaf Foundation has adopted it’s first batch of out-of-school kids to enroll in school and mentor. We’re calling them our SAF Kids. Interested in Keeping up with the progress of the SAF Kids & the Foundation’s activities? Meet Jamilu 👋🏼He really loves to learn! The youngest in class, his teacher tells us he learns way faster than his peers.